This week begins a series of summer fun storytimes. One thing many families do during the summer is take a trip to the zoo. We started with our usual opening song, introductions, and lead-in song. During the introductions we discussed our favorite zoo animals. 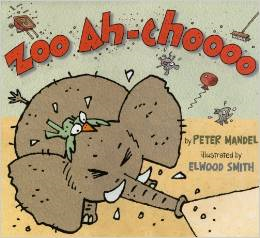 Our first story was Zoo Ah-Choooo by Peter Mandel. This story begins with a sleepy zoo day, interrupted by a loud sound, which turns out to be the snow leopard sneezing. One by one, the sneeze spreads to the other animals. I chose this book because I thought the kids would enjoy all the different sneezing sounds, and I could tell them my story about being sneezed on by the elephant at the zoo when I was about their age. The story is cute and funny, but I do think the text could have been written a little better; it is a bit awkward in some places. The elephant sneezed, and fell on his knees. Four, three, two, one.....No more monkeys swinging in the tree. 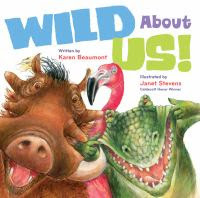 For our second story we read Karen Beaumont's latest book, Wild About Us! I chose this first because I fell in love with the smiling crocodile on the front cover, but all of the illustrations are very well done, fairly realistic, yet also with a cute, cartoon-ish quality. The text has a great rhyme and cadence, which makes it fun to read. At first I thought the message of being proud of what makes you different, and not judging people by appearance was a little heavy-handed, but after I read it a second time out loud, I changed my mind. We followed that up with a rousing round of "If You're An Animal And You Know It," using several different zoo animals and their corresponding sounds or actions to the tune of "If You're Happy and You Know It". The kids always love doing these type songs, and can be expected to get a little loud and rowdy, but it's all in good fun. If you're an elephant and you know it, swing your trunk. If you're an elephant and you know it, your trunk will surely show it. hippo....wiggle your behind, crocodile...snap your jaws. 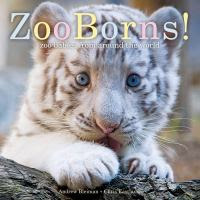 For our last book I chose Zoo Borns! by Andrew Bleiman because everyone loves cute baby animals, and the kids could try to guess what they were. Some are pretty easy, but there were some animals in there even I would not have known, like the okapi. The book has beautiful up close photographs with the name of the animal and a little blurb. At the end of the book, it gives more information about each animal and what zoo they were from. Then we ended with our closing song followed by a hand stamp. Today ended up being rather frustrating. I got to the daycare to find that my regular kids were gone, attending VBS at one of the churches that sponsors the center. I really wish they had let me know, and I would've just saved it for next time, but they wanted me to go ahead and do storytime with the group of stragglers that were still there, kids that didn't get to daycare in time to go with the group to VBS. These were all kids I had not had before and didn't know the routine, and were on the younger side. If I had known, I would have prepared a different storytime and I was kicking myself for not having any shorter books. As it was, I had a very hard time keeping them engaged in the first book and the first song and rhyme. However, they did really like Wild About Us! and listened much better with that one. I think the bold illustrations of just a single animal on each page attracted and held their attention much better, as well as the rhyming text. They also liked doing the "If You're an Animal and You Know It" song and imitating all the animals. By the time we got to Zoo Borns! I didn't even try to read the text, just told them the animal's name and let them guess what kind of animal it was.